Containers filled with seasonal or permanent plants are extremely versatile. They can brighten up a corner of the garden, provide handy herbs by the kitchen or make the entrance look welcoming. Yet, life in containers can be tough for plants, so choose the right compost and carry out regular maintenance to ensure they put on a good show. Containers are the perfect home for colourful annuals and half-hardy perennials - both of which are sometimes called 'patio plants' or bedding. Most shrubs, climbers, herbaceous perennials, grasses and even trees can be grown in containers. Fruit and vegetables can be successful too, as can some roses. 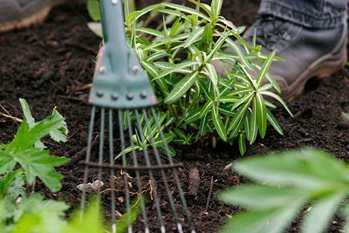 Composts for containers are not the same as garden compost made in your compost bin, but specially formulated for use in pots and often called potting compost or potting media. Vine weevil can be a problem for any plants in containers, but fuchsias are particularly susceptible. Other pests to watch out for include aphids and glasshouse red spider mite, while diseases such as impatiens downy mildew, primula leaf spots, pansy: downy mildew and pansy: leaf spots may hit specific bedding plants. Algae, liverworts and moss can also be problematic on containers. Also take care not to overpot.